It is replaced by the Datalogic Magellan 1100i. The Magellan 1000i is an Omnidirectional Imaging Scanner designed for "small-counter" retail environments. 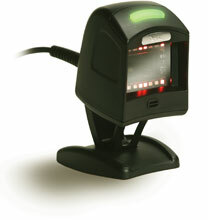 This new imaging technology improves checkout productivity by allowing users to scan barcodes in any orientation with a sweeping motion or a presentation style of scanning. The ergonomic design and small size allow for either hands-free scanning for small items or for use as a handheld scanner for large items. To optimize scan time, the tilting stand allows individual users to adjust the scanner to a comfortable scanning position. Additionally, the omnidirectional imaging technology of the Magellan 1000i eliminates misreads and quickly scans hard-to-read and damaged barcodes. Omnidirectional Imaging Scanner, USB, EZKit, with Target Mode and 12 ft. PIT Cable 5V. Color: Black. RS-232 serial kit. Includes cable, power supply, stand. Gray 12V with Targeting Mode, IBM USB, 12' Power Plus POT Cable, Stand. Gray 12V with Targeting Mode, IBM USB, 12' Power Plus POT Cable. Gray 12V with Targeting Mode, IBM 46xx, PT9B 12' Cable, Stand. Gray 12V with Targeting Mode, IBM 46xx, PT9B 12' Cable. Omnidirectional Imaging Scanner (12V, with Button, IBM, USB 12 ft. POT Cable and Stand) - Color: Black. Black 12V with Targeting Mode, IBM USB, 12' Power Plus POT Cable. Omnidirectional Imaging Scanner 12V, Trigger, IBM 466XX, PT9B, 12 ft. Cable and Stand - Color: Black.